The row over the Po Leung Kuk’s so-called leadership training camps casts an interesting light on Hong Kong’s obsession with militarism and uniforms. Overseas readers: students who have been to the camp complain about being made to eat grass as a punishment, lay in mud, and be grabbed and shouted at. Actually the camps are clearly not doing leadership training. If you want to get a grant to take your students away for a few days (but not far enough away to call it a study tour) the easiest thing is to say you are offering leadership training. Nobody knows what it means but it sounds like something useful. I must admit to perpetrating this innocent deception myself. Fortified by the training provided by the Hong Kong Scouts, for whom I was a voluntary leader, I decided to take all my journalism students who were willing away for a few days, so that the editors of the student newspaper might forge relationships with the reporters in a context less fraught than working on stories. We called it a leadership training camp on the grant application because I couldn’t think of anything else. After the first one I ditched formal sports and one or two other things which had not worked too well, and consulted some books on educational camps. In following years we settled on mostly team-building exercises, which are fun, physical, interesting and useful if you want people to get to know each other in an uncustomary environment. Team-building exercises involve giving a large group a task and letting them get on with it. If facilities permit you can have two or more groups and make a competition of it, but this is not essential. On the many videos posted by survivors of the Po Leung Kuk camp I found some of my old favourites. Leadership training is quite different. For this you need a much smaller group with a designated leader. After completing the task you examine the way the group performed, how the leader helped, or didn’t, and what worked, or didn’t. The result should be that members of the group have some idea of what effective leadership would look like in a small group. You then repeat the exercise with different tasks, and leaders. Some European universities offer leadership courses. Oxford actually offers a Diploma in Leadership. This is not done at a camp in the country. I don’t know what it is about Hong Kong people. They seem to love this stuff. My age group in the UK, saved from conscription only because it was abolished just before we reached it, regarded the military as a trap from which we had been rescued just in time. Hong Kong people, on the other hand, seem to enjoy wallowing in it. As we do not have an army (the PLA garrison spends most of its time in Shenzhen) the “patient zero” for this disease is the Hong Kong Police Force. Their parades are magnificent. They have two full-time professional bands. And they are assiduously copied. The only uniformed government department which does not have a band for parade purposes is the Fire Brigade. They borrow the police one. All the uniformed groups do parades except the English-speaking part of the Scouts, who are allowed to be pacifist. The biggest band in Hong Kong belongs to the Saint Johns Ambulance Service. Nurses do passing out parades in the full Florence Nightingale. Large numbers of adults dress in uniforms of their own devising and disappear into the countryside to shoot polystyrene pellets at each other. We are a city of reluctant civilians. Harsh treatment is justified by the need for the recruit to learn, as one general put it, that life includes pain and hardships, most of which are not distributed fairly. Clausewitz said that war is the domain of exertion, suffering and danger. The more of these you can import to the training, the better prepared the troops will be. This approach, even in a very attenuated form, is totally inappropriate to the education of Form Five students, and if inflicted on primary kids is in my opinion difficult to distinguish from child abuse. That is not to say that there is no place for challenging experiences. I used to take my scoutlets on a vessel called the Adventure Ship Huan. The captain was a very impressive character with advanced qualifications in both navigation and youth leadership. The kids would have walked through fire for him and so would I. Among other attractions was a sort of climbing course which led round the rigging. This was quite intimidating; I tried it. The kids were also encouraged, at one point, to jump off the highest part of the ship into the water. There was no shouting, no punishment, and no suggestion that refusal would be something shameful, but as far as I remember everyone managed both tasks in the end, and walked a bit taller when they got off the boat as a result. You don’t have to be a drill sergeant. Another objection to the military paradigm is that it is technically illegal. I am indebted to one of my legal friends who pointed out to me that under Section 18 of the Crimes Ordinance it is an offence if a person “trains or drills any other person in the use of arms or the practice of military exercises or evolutions” without the permission of the Governor or the Commissioner of Police. Clearly this covers foot drill, which is a military exercise, if an obsolete one. The name of the assault course speaks for itself. Many weeks ago I did try asking the Police Public Relations Bureau if anyone in Hong Kong had been given the necessary permission but I have not yet had a reply. So this may be another of those laws which the Department of Justice no longer thinks it worth enforcing. 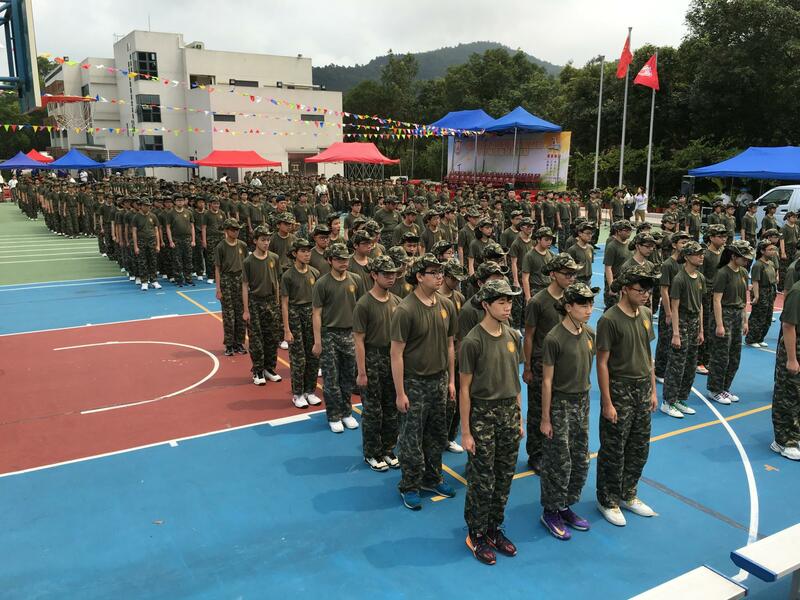 A further point which may worry parents is that it seems the camp, at least as supplied to Po Leung Kuk schools, incorporates what some of us call national education and some of us call brainwashing. The Tong Nai Kan School website, for example, promises “marching training, national education and field-trip challenges to develop students’ leadership skills, team spirit and further foster a sense of belonging to the school and our nation.” Lo Kit Sing College says to parents that “The aims of the training are to arouse students’ patriotism and nurture their leadership and team spirit.” Po Leung Kuk Number One W. H. Cheung College says that “The training camp aimed at enhancing self-confidence, discipline and cooperation among students through national education and outdoor adventure activities such as wall climbing.” Whatever you think of national education as a school subject, the sort of teaching approach which is appropriate for citizenship education is totally different from that used in “outdoor activities such as wall climbing”, and the two are unlikely to cohabit happily. People with unfulfilled military ambitions should be kept well away from the kids. Skip the politics. See above. This activity is listed by all the schools I could find expressing an opinion on the matter as compulsory. It should be voluntary. This sort of thing is not for everyone. Cosplay is not the same as actually joining the military. And those camp recruits have some pretty lousy costumes.